This article explains the LABEL ARCHIVE error message “Maximum Number of Connections Has Been Achieved” and details how to fix the underlying problem that caused it to appear. On the server, run the LABEL ARCHIVE Upgrade Wizard. If the software is NOT licensed, it will prompt the user to Activate. If it is licensed, it will show how many users are licensed. 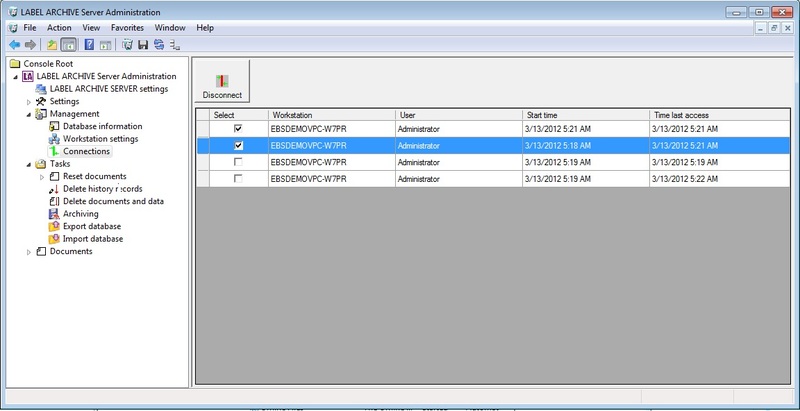 Log into the LABEL ARCHIVE Server Administration. From the Console Root, select ‘LABEL ARCHIVE SERVER settings \ Management \ Connections’. Select each user you want to disconnect then press the Disconnect button.